May 20, 2017 – Anthony Lamacchia attended the National Association of Realtors annual legislative meetings in Washington D.C. last week with over 8,000 other Realtors from around the nation. 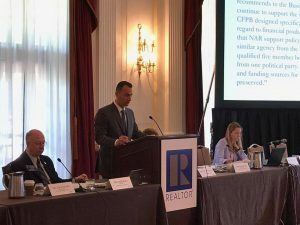 Over last 3 months, Anthony served as Chairman of a committee of several Realtors from around the country to come up with a policy position for the Consumer Financial Protection Bureau and to update the National Associations Lending Principles. Working alongside Anthony were 14 members: Bill Arnold (AZ), Scott Caballero (TX), Otto Catrina (CA), John Kmiecik (IL), Kenneth Libby (VT), Cliff Long (AL), Jenny Pakula (OR), Barbara Palmer (CA), Seth Task (OH), Marty Wagar (MI), Jeannette Way (CA), Steve White (CA), Dave Wluka (MA), and Jack Woodcock (NV). After numerous conversations, this workgroup came up with what they determined would be the best arrangement for the structure of the Consumer Financial Protection Bureau, which was created to protect consumers against bad loans, credit cards, and more after the financial crisis. Since its inception, it has relied on a single director. This group came up with what they believe is an improved leadership structure which is having a five-member board with no more than three members from one political party. Last week when Anthony was in Washington D.C., he presented to the Lending Principles updates to the Real Valuations Committee, and then the CFPB changes to the Conventional Lending and Finance Committee, which he is a part of, along with the Business Issues Committee. The policy was approved by those three committees and then approved by the Public Policy Coordinating Committee, the Executive Committee and finally, the Board of Directors on Saturday.